Prestovent is the innovative new ceiling register that’s different from traditional ceiling registers in every way. 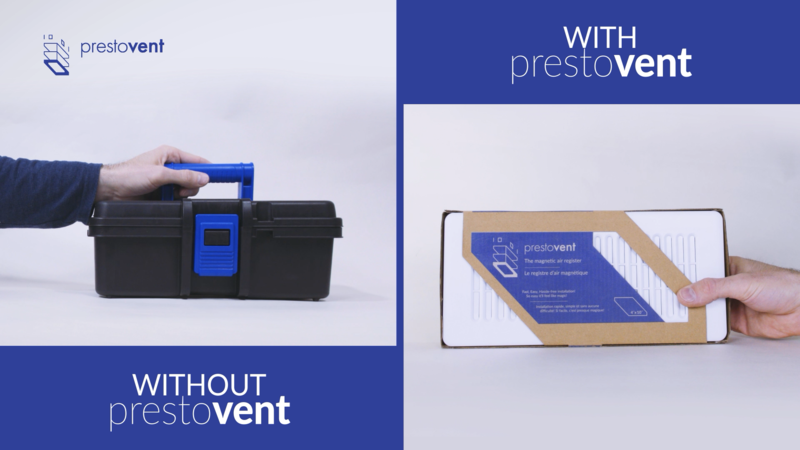 Prestovent is secured in place with 4 powerful earth magnets that attach to the metal duct boot of all common ceiling vents. Prestovent requires no tools. Simply insert and it is secured in place. No screws or mounting holes required. We realized we needed more space when my wife was pregnant with our second child, so I took on the project of finishing our basement. Things were progressing smoothly until the final touches, which I did not think would be the bump in the road. I had cut the vent holes and bought ceiling registers. I was so excited to simply install them and reveal our basement, but that wasn’t the case. I spent a lot of time on YouTube and searching the web for how to properly install these registers. It quickly came to my realization that most people struggle with this and craft some innovative, yet not so effective, ways. I knew there was an easier solution, and presto… I figured it out! Realizing that ducts were made out of metal, I thought of creating a register with earth magnets that would be light, easy to install, and effective! A lot of brainstorming, prototype tweaking and thought went into this. What sold the idea was the simplicity that friends and family experienced when installing them into their own ceilings. Magical! Simple! Effective!A clean finish! A simple invention that solves so many renovation problems! Another bonus; duct cleaning won’t be such a hassle! The ventilation system in your home is equipped with galvanized steel duct work which is magnetic. prestovent has 4 very powerful magnets that attach to this duct work once it is inserted into the rectangular 4×10″ cut out in your ceilings (or floors). It is as easy as that! How do you remove prestovent? With some force, as you pull down, the prestovent comes out and disconnects from the duct. Can I use it in my floors? Absolutely! A common complaint is that floor registers make a rattling sound as air comes through the vent. This is the solution! prestovent will rid you of that irritating rattling sound. the cutout in my ceiling? You may have to cut a slightly larger hole in the ceiling (i.e. Drywall), this prestovent is meant to fit in a 4×10″ hole. Not at the moment but they are paintable! What is an earth magnet? They are powerful magnets made of the element neodymium and are nickel-plated to prevent it from any corrosion. They are able to withstand very high temperatures (80°C). We have a 30-day full exchange/refund policy. If you are not completely satisfied with the prestovent, please email us with the details and we will get that processed immediately.